Alberto Contador (Tinkoff) bounced back from his disappointing performance in the first mountain stage by claiming a dominant solo win at the top of the Alto do Malhao on the final stage of the Volta ao Algarve. The Spaniard put 20 seconds into Fabio Aru (Astana) and Thibaut Pinot (FDJ) while Geraint Thomas was 8 seconds further back in fifth. That was enough for him to win the race for the second time in a row with a 19-second advantage over Ion Izagirre (Movistar) and 26 seconds over Contador. Going into the Volta ao Algarve, Alberto Contador claimed that he was more motivated than ever and he did nothing to hide that he aimed for victory in the Portuguese race that has always been a happy hunting ground for him. Hence, most were surprised when he was dropped in the first mountain stage and failed to finish in the top 20. Contador claimed that he had spent too much time in the wind and that he would be ready to go for glory on the final stage which finished at the top of the Alto do Malhao where he had won two times in the past. He clearly showed his intentions by having his team ride on the front and by the time they hit the final climb he immediately silenced his critics, claiming an impressive and extremely dominant solo win. On the climb, Alexandr Kolobnev (Gazprom-Rusvelo) rejoined Mas while the chase group and the peloton exploded. Kolobnev dropped his companion and was first at the top, with Mas crossing the line in second. The peloton was just 20 seconds behind and led by Sky and Movistar. The fast pace had split the group in two and among the casualties was race leader Tony Martin. That made Movistar and Sky ride harder and they brought both Mas and Kolobnev back with 40km to go. Martin rejoined the peloton on the descent but he was in the rear end when the group split in the crosswinds. With 35km to go, the second group was 30 seconds behind but Martin was in the third group. It was a huge battle between the two first groups, with three FDJ riders leading the first bunch. With 30km to go, the gap was 15 seconds and the junction was made one kilometres later. However, Martin was not 1.27 behind. On the next climb, Kolobnev attacked again to win the KOM sprint while Yoann Offredo and Johan Le Bon were first from the peloton as FDJ were doing a lot of damage. They brought the Russian back and set a fast pace that made it impossible for anyone to attack. As they approached the final climb, the fight for position intensified and it was a compact group that hit the ascent. Contador attacked almost immediately and passed the flamme rouge with an advantage of 10 seconds. 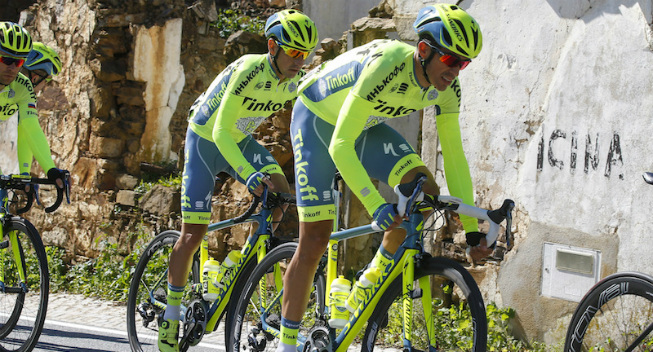 Behind the lone Spaniard, the group splintered to pieces but they failed to make up time on Tinkoff leader. He crossed the line to take a comfortable solo win while Fabio Aru, Thibaut Pinot and Amaro Antunes (LA Aluminios) reached the finish 20 seconds later. Geraint Thomas did well to finish fifth, just 8 seconds further back, alongside Primoz Roglic (LottoNL) and Rigoberto Uran (Cannondale). That allowed him to defend his title in the Portuguese race with a 19-second advantage over Ion Izagirre. Contador moved into third, 26 seconds behind the Brit. Marcel Kittel (Etixx-QuickStep) won the points classification while Kolobnev was the best climber. Tiesj Benoot (Lotto Soudal) was the best young rider and Katusha was the best team. With the Volta ao Algarve now over, the stage racers will take a break before they turn their attention to Paris-Nice and Tirreno-Adriatico. The next major event in Portugal is the Volta a Portugal in August. After yesterday’s sprint stage, the climbers were back in action on the traditional queen stage of the race which brought the riders over 169km from Almodovar to the mountaintop finish on the Alto do Malhao. After a lumpy first half with one categorized climb, the riders hit the final climb for the first time, reaching the top with 42.8km to go. Then they tackled a small circuit that included another two climbs before they tackled the 2.9km climb that averaged around 9%, for the second time. It was another sunny and windy day in Portugal when 167 riders headed out for their neutral rider. Wouter Wippert (Cannondale), André Greipel (Lotto Soudal) who crashed yesterday, Rein Taaramae (Katusha) who suffers from knee problems, Roman Maikin (Gazpriom-Rusvelo) and Oscar Gonzalez (Sporting-Tavira) were non-starters. It was a fast start with lots of attacks and it was hard for anyone to get clear. After 9km of racing, Dylan Groenewegen (LottoNL) took off and he was joined by Lluis Mas (Caja Rural) and Carlos Jimenez (Radio Popular). Simon Pellaud (IAM), Anton Vorobyev (Katusha), Yaroslav Popovych (Trek), Jan Barta (Bora-Argon 18), Alexandr Kolobnev (Gazprom-Rusvelo) and Filipe Cardoso (Efapel) took off in pursuit and they made the junction to make it a 9-rider group. Charles Planet (Novo Nordisk) tried to bridge the gap but he quickly sat up. Meanwhile, the peloton slowed down and allowed the gap to go out to 1.55 after 15km of racing. The gap grew quickly and was 4.25 at the 16km mark. That’s when Tinkoff and Movistar started ´to chase and they kept it at around four minutes for a while. Domingos Goncalves (Caja Rural) left the race at the end of the first hour during which 38km were covered. Here the peloton slowed down and the gap had gone out to 5.20 at the 46km mark. Vorobyev led Kolobnev and Cardoso across the line in the first sprint while the peloton continued its slow pace. They were 5.30 behind as they entered the final 115km. The peloton finally upped the pace and had reduced the gap to 3.50 at the entrance of the final 100km. Tinkoff and Movistar set the pace and had brought it down to 3.25 at the end of the second hour where the average speed was only 36.5km/h. As they hit the first climb, Tinkoff accelerated hard and when Kolobnev led Barta and Mas over the top, the gap was down to 2.45. It stabilized around 2.30 as the peloton took time to refuel. While Ralf Matzka (Bora-Argon 18) abandoned, Movistar lent Tinkoff a hand as they put two riders on the front. Popovych beat Vorobyev and Mas in the second intermediate sprint. As they had reduced the gap to 2.10, Mas attacked and put 15 seconds into his chasers with 50km to go. Jimenez was distanced from the chasers who were 21 seconds behind at the bottom of the Malhao where the exciting finale started.